Large and comfortable apartment in the center of the city, nearby Old Town, walking distance from Brivibas Str, near transports that will allow you to reach the other parts of the city, near shops and restaurants. Independent heating, cable TV, cd & dvd player, washing machine, dishwasher, microwave, jacuzzi tub, internet WiFi, elevator, street parking. Our neo-classic building is located in a quiet and prestigious area of Riga center nearby Old Town, and it makes our apartment excellent choice for both business and vacation guests. Modern elevator goes to the 4th floor to the spacious (171 m2 - about 1880 sqf), light and luxuriously furnished 4-room apartment, incorporating huge master bedroom of 48 m2 and a spacious living room of 50 m2. High ceilings, modern double-glazed insulated windows with vertical jalousie, oak parquet on the floors, independent gas heating (new heat radiators) and hot water supply, a high-speed optical WiFi internet and cable TV with international channels. USB charger and HDMI cable are at hand. Free local phone is supplied to help our guests order taxi, reserve restaurant, or theater tickets, and, also, we offer to our guests discount cards for use at local supermarkets, restaurants and wine shops. The master bedroom has a king-size double bed, bedside tables with lamps, large mirrored wardrobes, couple large soft chairs with a coffee table, and a marble fireplace. Two more bedrooms are equipped accordingly. Spacious sofas around a large coffee table, a dining table for 10 guests, flat- screen TV with a DVD player and fireplace are in the sitting room. A modest library of CDs, DVDs and books is present complimentary, as well as information regarding events in Riga. The apartment has 2 bathrooms. The main bathroom is off the master bedroom featuring a full-sized Jacuzzi tub, bidet, toilet, sink and hairdryer. Its tiled floors and mosaic walls are lovely and there is a huge lighted mirror to make sure you look your absolute best before heading out to enjoy Riga's sites. The other bathroom has shower, toilet and sink. Kitchen has incorporated Danish furniture (light oak), table for 6 persons, a gas stove, a refrigerator, a dishwashing machine, a coffeemaker and a toaster. It is equipped with kitchenware, tableware and flatware (BergHOFF). Washing machine is in the spare room just in case. Fresh bed hotel-quality linen and towels (two for each guest), as well as toiletries are supplied complimentary. 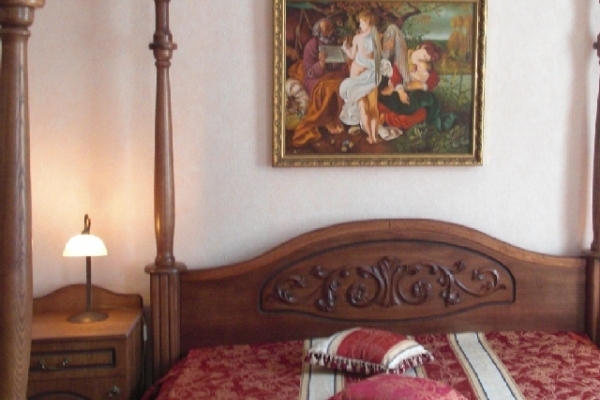 We proud ourselves with decorating walls with oil copies of fine artwork paintings by famous artists. We are just a few steps from the central Brivibas Str and with a beautiful view of the nearby ancient Gertrudes Church. Breakfast choices are plentiful at several nearby restaurants and cafes. "Galeria Riga" (new 7 floors shopping and leisure mall) and Royal Casino at Radisson Blu Hotel are in 10 minutes walk. It is very quiet here - no construction, repairs, or any other inconvenience nearby. And - it is very crime safe too. Public parking and shuttle bus stop to the airport is just 5 minutes walk. For visitors who wish to explore Riga on foot, this is an excellent point from which to do so.